A flowing mane, strong back and four sturdy legs can carry a disabled person into a previously unknown world! Horseback riding at Bergemo means: transcending the disability, temporarily being able to move without crutches or wheelchair, and thus increasing the joy in life! The social aspect of equestrian sports is also very important. Not just the friendship between rider and pony/horse, but also the interaction with human companions can be life changing and may help the disabled person to cross many developmental thresholds. If you are interested and/or want to make our acquaintance, please contact us to have a free and informal talk. The Bergemo riding camps are all about fun! 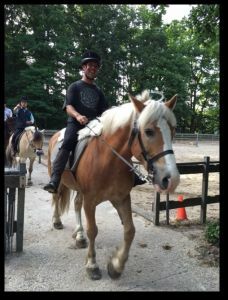 Exploring the woods, helping in the daily care of the ponies and horses, taking horse-drawn covered wagon rides and sitting by the camp fire, all under the supervision of experienced staff. FNRS Equestrian Centre Bergemo can boast years of experience in organising and supervising horse riding camps for riders with a slight impairment. Click here for more information.